Click here for driving directions to the park visitor center. Click here for information on Maryland side of Great Falls. People come here to enjoy the view as the Potomac River rushes through a narrow gorge. There are 3 overlooks within a short distance of the visitor center each offering views of the falls. Picnic tables are available and an exhibit at the visitor center provides some history of the region. George Washington started the Patowmack Company to build a canal around the falls in order to stimulate trade via the Potomac River. The remains of this canal are still visible here. The above map includes landmarks that are familiar to Fairfax County fire and rescue personnel. It would expedite rescue if you can identify the nearest landmark to the incident you are reporting. Click here to print the map. The Canal trail (2.5 miles). This walk follows the full length of the Patowmack Canal from the feeder dam to lock 5. The walk is wheelchair accessible from the feeder dam to lock 1. The walk includes side trips to overlooks 1, 2 and 3. Overlooks 2 and 3 are wheelchair accessible. The Matildaville trail (2.7 miles). This is a loop walk that follows the Canal trail to Matildaville. It then follows the Matildaville trail to its end at the Ridge trail. The walk returns via the Old Carriage Road. The Great Falls Difficult Run trail (2.4 miles). 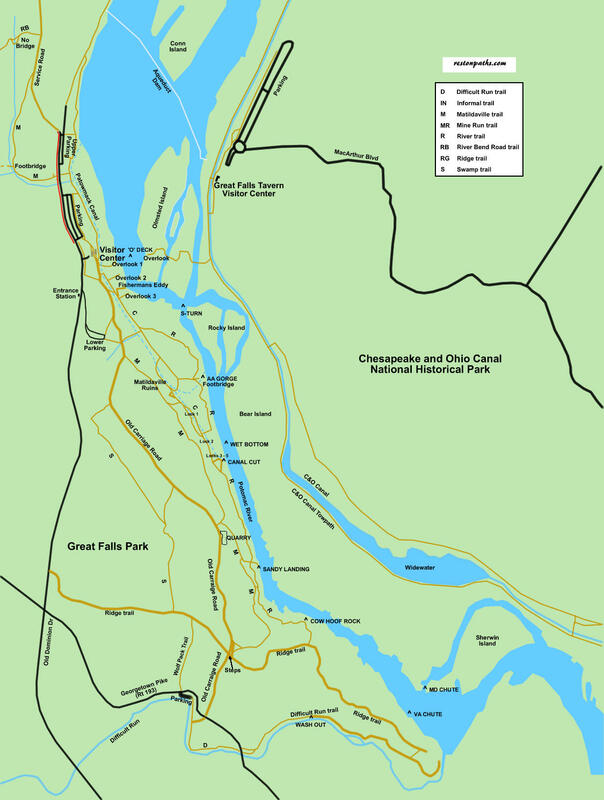 This walk follows Difficult Run through the park from Route 193 to the Potomac River. It returns via the Ridge trail. This walk is remote from the visitor center and starts from a special parking area on Route 193. This is part of the Fairfax Cross County trail system but this section of the trail is maintained by the National Park Service. The Riverbend Park to Great Falls Park walk (3.8 miles). This is a loop walk from the Riverbend Park visitor center to the Great Falls Park visitor center. Normally the walk starts at Riverbend Park but it can be started at the Great Falls Park visitor center in order to tour Riverbend Park. This walk is not recommended when the river level is high as the trail along the river may be under water or very muddy in places during such times. However, under normal conditions the section of the walk along the river is quite scenic. The next 2 web pages contain pictures of some of the activities in the park including a trip over the falls. After looking at them come back here to select a possible walk route.